We went on a drive along the Mosel river to make good use of our limited time in Germany. It was a beautiful summers day with blue sky and temperatures in the low 30ies. We drove upriver to Wasserbilligerbrueck and north along the Sauer, a tributary of the Mosel. 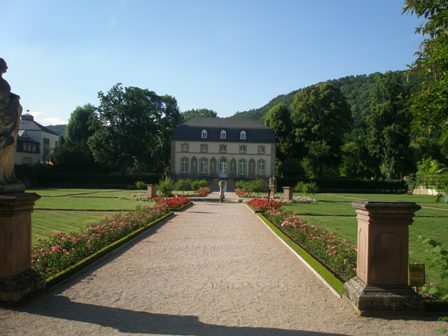 Echternach on the Luxembourg side was our aim, a beautiful medieval town in eastern part of the Grand Duchess at the border to Germany. 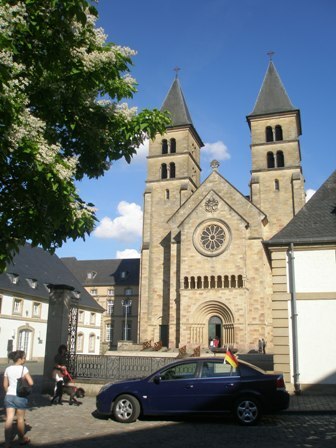 Echternach is famous for the rhythm of its annual procession, the “Echternacher Springprozession”: two steps forward, one step backward, the rhythm of many political reforms. Elbling is an old grape variety with an obscure origin but it has been widely planted in the Mosel wine region for many centuries. From medieval times until the 20th century Elbling was the most planted variety in this part of Germany. Nowadays it is a variety in decline. Not much is left of it, though, maybe only about 600 ha in Germany and about 150 ha in Luxembourg. Elbling grapes make a rather neutral white wine with high acidity. It is the wine for every day in the southern part of the Mosel wine region. More often than not it is used for sparkling. In wine tastings Elbing does usually not feature at all. There is even a revitalized Elbling wine route along the Upper Mosel at the right side of the river from Thorn, Palzem, Wincheringen, Nittel, Wellen, Temmels, Oberbillig until Wasserliesch and at the left side of the river from Igel to Langsur and along the Sauer river, a tributary of the Mosel from Mesenich to Metzdorf. We explored the town, the cathedral, the abbey and many of its public places which were filled with locals and some foreign tourists. 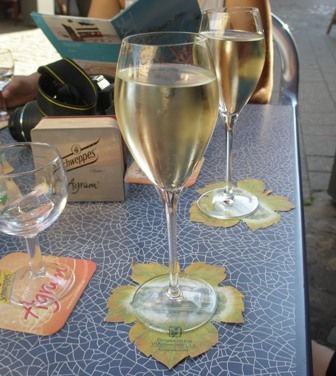 When we finally settled in a small cafe, it was clear what we were going to order, the house-wine of the place. While the children enjoyed an ice cream, we indulged in a local Elbling. It was dry, clean and crisp with fine acidity; a great drop for a hot summers day. Come and visit this part at the heart of Europe. It’s worth it. This entry was posted on Thursday, July 8th, 2010 at 5:32 am and is filed under wine, wine regions. You can follow any responses to this entry through the RSS 2.0 feed. You can leave a response, or trackback from your own site. Really enjoy your reviews of Trier and the Mosel wines. My family emigrated from near Konz to Wisconsin in 1852. My wife Molly and I were doing family research in Trier 18 years ago and greatly enjoyed the refreshing Elbling wines of the the Mosel and Sauer regions. Probably they first caught my fancy because their antiquity and the fact that they are grown on the “Roman Mountain” above our namesake village of Oberbillig. Hopefully someday I will get to tour the “Elbling wine road” that you mention. Do you know of any importer who is bringing Elbling wines into the United States? Love to have a source where I could buy it here. (We live near Seattle.) Thanks! Purple Feet Wines in Pewaukee, Wisconsin imports a 2011 Elbling Mosel. Just bought a case from Vom Fass on University Avenue in Madison…researching Elbling when I stumbled across your comment. Great wine!